Cajeput essential oil, Australia shares properties with tea tree and eucalyptus both in chemistry and aroma. This oil is expected to grow in importance in the upcoming years as use of essential oils increases. * Relieves pain and muscular aches - It is an ingredient in some liniments for sore muscles such as Tiger Balm and Indonesian traditional medicine Minyak Telon. Cajeput is also known as white tea tree oil. Traditionally it was used in Australia & Malaysia for its antiseptic & analgesic properties. Introduced to Europe in the 17 th century, Cajeput was eventually prescribed for everything from urinary infections to respiratory complaints. It is now used for colds and flu, nasal & sinus congestion. Cajeput is useful as an inhalation to combat sluggishness. It blends well with citrus, geranium, eucalyptus, ginger, peppermint, rosemary and many others. 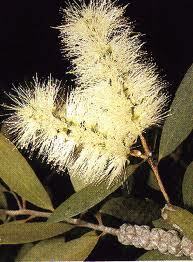 Cajeput essential oil, Melaleuca cajeputi, clears and stimulates the mind, aiding in concentration. Use in chest rub to bring down high temperatures and encourage the expulsion of mucus and congestion. Use in massage oils or salves to relieve pain in muscular aches, arthritis, and rheumatism. Spiritually used to elevate the spirit and encourages the creation of new pathways. Cajeput essential oil has been held in high regard in the east where it is used for colds, headaches, throat infections, toothache, sore and aching muscles, fever, rheumatism and various skin diseases. Only the oil is used in the Western herbal tradition, and is known for producing a sensation of warmth and quickening the pulse. It is used for chronic laryngitis and bronchitis, cystitis, rheumatism and to expel roundworm. Used in dentistry and pharmaceutical work as an antiseptic; in expectorant and tonic formulations, throat lozenges, gargles, etc. Used as a fragrance and freshening agent in soaps, cosmetics, detergents and perfumes. Occasionally employed as a flavor component in food products and soft drinks. Cajeput is a proven ‘unwinding’ oil which improves mood and increases resistance to infections. It has a camphorous and medicinal scent. The oil can be used in a steam inhalation to help clear the nasal passages and is also helpful when treating oily skin and blemishes. When diluted, cajeput oil has been used to treat acne, colic, bruises, earache, eczema, psoriasis, rheumatism, scabies, scurvy and burns. In Malaysia, tea tree oil is used as a pain killer. A Burmese mix of cajeput oil with camphor and use it to treat joint and bone problems. It can be directly applied to ringworm lesions and athlete’s foot infestations. Insect bites and impetigo can also be treated successfully with oil of cajeput.When diluted, cajeput oil has proven effective as a douche in treating yeast infections or Candida. It can be mixed with sugar, 1 to 10 drops of cajeput oil on a sugar cube for colds, throat infections and to treat intestinal parasites like roundworm. The sugar cube treatment can also be used to treat cholera and colic. It can also be used in water as a gargle to treat laryngitis and bronchitis. Cajeput’s vapors are decongestant and expectorant, making it a useful antiseptic for respiratory ailments such as laryngitis. Its refreshing action also clears headaches and fatigue and apathy associated with flu. Cajeput is an effective treatment for urinary or digestive infections, especially those that are recurring. Blended with rosemary or marjoram oil, it makes a warming muscular rub to ease muscular stiffness and rheumatic aches. It is also an effect natural remedy against head lice or for ridding your home of pet flea infestations. 1. Anti Neuralgic: Neuralgia is a very painful situation in which the entire oral zone, including the throat, ears, tonsils, base of the nose, larynx and pharynx and the surrounding areas suffer from severe pain due to compression of the Glossopharyngeal or the ninth cranial nerve by the surrounding blood vessels which tend to swell from chewing, eating, laughing, shouting or any other excitement or movement in that region. 2. Carminative: Cajeput Oil can give you a good relief from the gas trouble as it has carminative properties. It restricts formation of gas as well as helps remove the gas already formed in the intestines. 3.Febrifuge:It helps reducing fever by fighting infection as well as by bringing sweat, which cools down the body. 4. Analgesic:It is analgesic in nature, i.e. it reduces feeling of pain. When applied locally, such as on an infected tooth in case of a toothache or rubbed on forehead in case of headache or on sprains, it gives quick relief. If ingested, it can reduce pain in joints, headache and muscles etc. in case of fever, cold etc. 5. Stimulant and Sudorific:It stimulates the organs, gives a warming effect, promotes circulation and activates secretions. Being a stimulant, it also stimulates the Eccrine glands promoting perspiration and thus serving as a Sudorific. These effects are very beneficial to the body as with the help of these, the toxins are removed from the body. 6. Cosmetic and Tonic: It smooths and brightens skin and keeps it free from infections, thus used extensively in cosmetics, anti septic creams etc. It also tones up the skin and hence used as a tonic. 7. Decongestant and Expectorant:Just like the Eucalyptus Oil, it is also an expert decongestant and expectorant. Being a decongestant, it gives immediate relief in congestion of nose, throat and other respiratory organs as well as in coughs, infection and resultant inflammation of throat and respiratory tracts such as laryngitis, pharyngitis and bronchitis. 8. Insecticide and Vermifuge: Very efficient in killing and driving away insects. Its insecticidal properties are so strong that its diluted solution can be sprayed or it can be vaporized with the help of a vaporizer to drive away mosquitoes, ants from the rooms. Mosquito nets can also be dipped in its solution for added benefits. Its diluted solution can also be rubbed on the body to keep away insects. It also kills the intestinal worms if a very mild diluted solution in water is taken. 9. Anti Septic and Bactericide:These are perhaps the most priced properties of Cajeput Oil. It is very efficient in fighting infections from bacteria, virus and fungi, such as tetanus, influenza etc. and infectious diseases like cholera, typhoid etc. It can be externally applied on cuts and wounds from rusty iron etc. to protect against tetanus, until vaccine is taken.